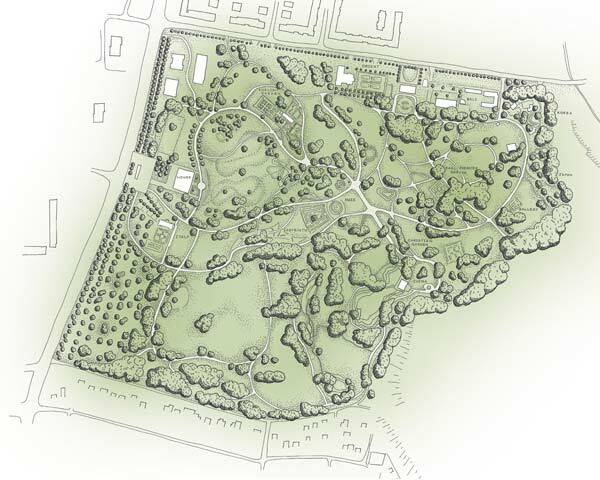 Landscape Competition to design an English Garden for the Gardens of the World competition for the Marzahn Recreational Park in Berlin. This winning competition entry drew on English landscape design traditions and included an English cottage with traditional cottage garden, vegetable garden and orchard. This was set within surrounding parkland comprising an estate drive, lime avenue, spring and summer meadows, a bridge over a pond, contemporary follies, a ha ha and a ‘traditional’ Manchester Cow Parade. Our design will be constructed in 2012. As Project Landscape Architect, Carolyn Willitts designed the masterplan, created the graphic style and the A0 Competition Boards and hand drew the plans. 3d visualisations were created by Andy Gough. The Park comprises an area of around 18 ha and sees over 600,000 visitors each year. Since 2000, several gardens representing garden traditions of different cultures of the world have been created including Italian, Oriental, Balinese, Korean, Japanese and Chinese Gardens.